For fans of single column Bibles and the New King James Version, the Schuyler NKJV is a great discovery. I have to be honest and say I drooled and coveted (and all that unseemly stuff) when I saw Schuyler’s first printing of this Bible in 2013. But I was a little put off by the very large “Holy Bible” on the cover of the first printing and the high price. The second printing of Schuyler’s single column NKJV Bible leaves off the large gold stamping of “Holy Bible.” The blind-stamped Jerusalem Cross strikes the right touch–understated and elegant. The subtle variation in color on the brown marble finish make this brown version especially attractive. The Schuyler NKJV is also available in Black, Firebrick Red, and Imperial Blue. 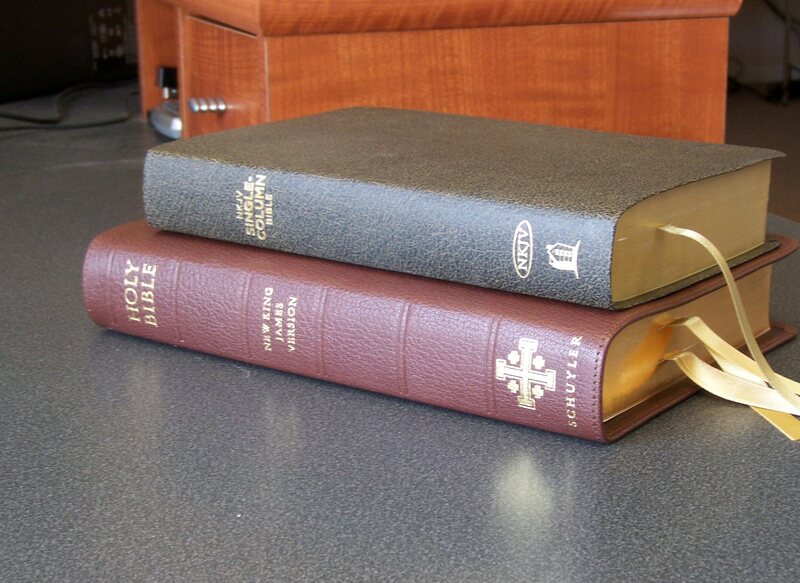 Then I made another discovery: The same text block had originally been offered by Thomas Nelson Publishers in 2009 in a mass market, glued binding, bonded leather edition, with less than desirable paper–available from Christianbook.com for less than $20. What to do?–a layout I love in a binding that is everything I hate. But… when Christianbook.com dropped the price on sale to $14.99 (and I had a code for free shipping), it was too good to pass up. 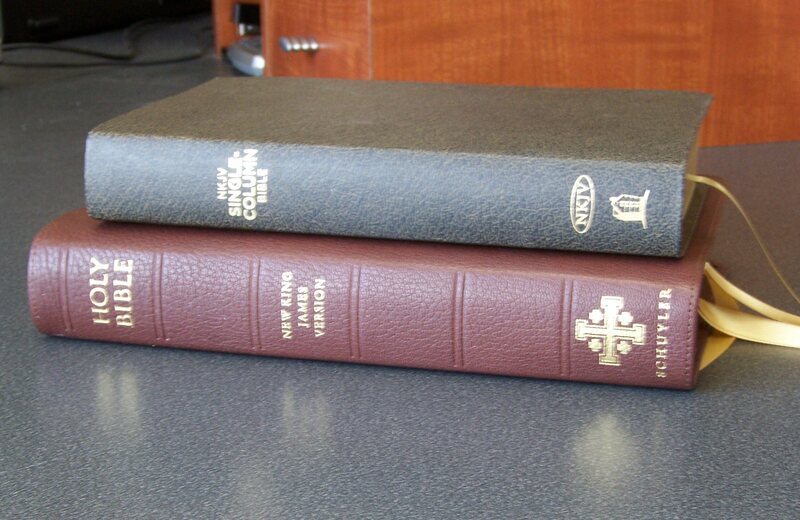 The Thomas Nelson NKJV (top) and the Schuyler edition (bottom). Two sizes and two very different editions of a fine and attractive layout. So my little bargain arrived; and I have to say, I was more than pleased. Certainly if I had paid the retail price of $39.99 for it, I would have been sorely disappointed. But it was well worth the $14.99 I had paid. And I subsequently bought one at Christianbook’s $19.99 price to give to a friend who wanted a rugged but readable NKJV. 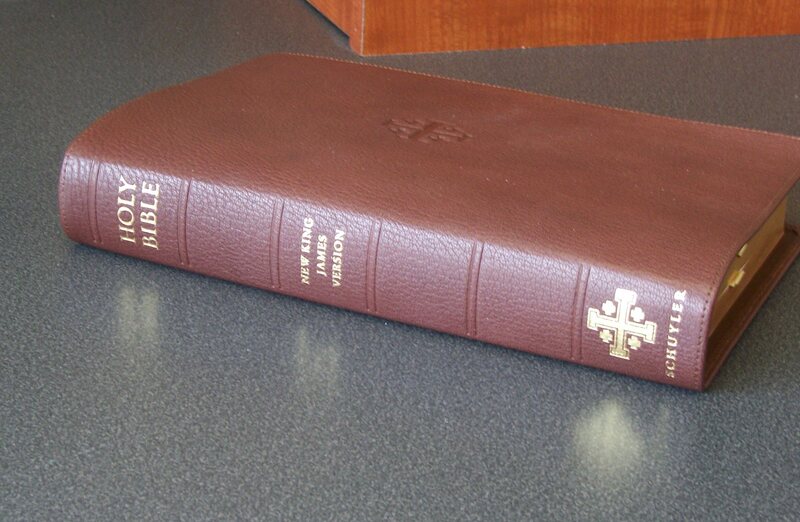 The Thomas Nelson version has a glued binding that only lies flat when opened to near the center of the Bible. The attractive layout is marred by inferior paper. Rugged but readable is the key. While I take very good care of all my Bibles, an edition that is too fancy sometimes intimidates me to the point that I am almost afraid to read it–with the result that I find myself reluctant to put a high-quality Bible through the rigors of everyday use. However, I fell in love with my bargain of a single-column NKJV. And, when Schuyler came out with the second printing of their single-Column NKJV (with no “Holy Bible” in huge letters on the cover), I broke my piggy bank and placed an order. I was ready to enjoy the layout I loved in an edition that did it justice. If you are not familiar with Schuyler, it is an imprint created by Evangelicalbible.com (from a family name). I’ll say more about Evangelicalbible.com in a future post. But, the short story is that they had sold high-end Bibles for so many years, and became so aware of what their customers were looking for in quality editions of the Bible, they decided to create their own brand. The result is some of the best editions of a growing selection of translations in print today. 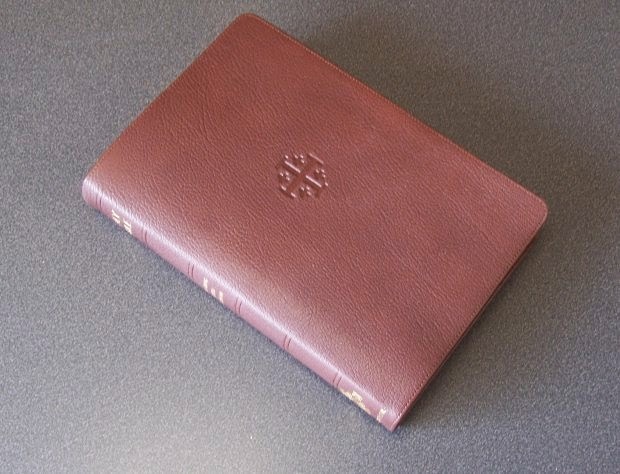 The Smyth-sewn binding allows the Schuyler NKJV to lie flat when opened–a feat that the less expensive Thomas Nelson version cannot come close to matching. When lying open, you can see the red under gold effect of the art-gilt edges. What does the difference between $19.99 and $190.00 get you? A Cantara Goatskin cover that is as beautiful as it is durable. A Smyth-sewn binding, where the pages are sewn into the binding in signatures, instead of the edge-glued pages of the less expensive version. 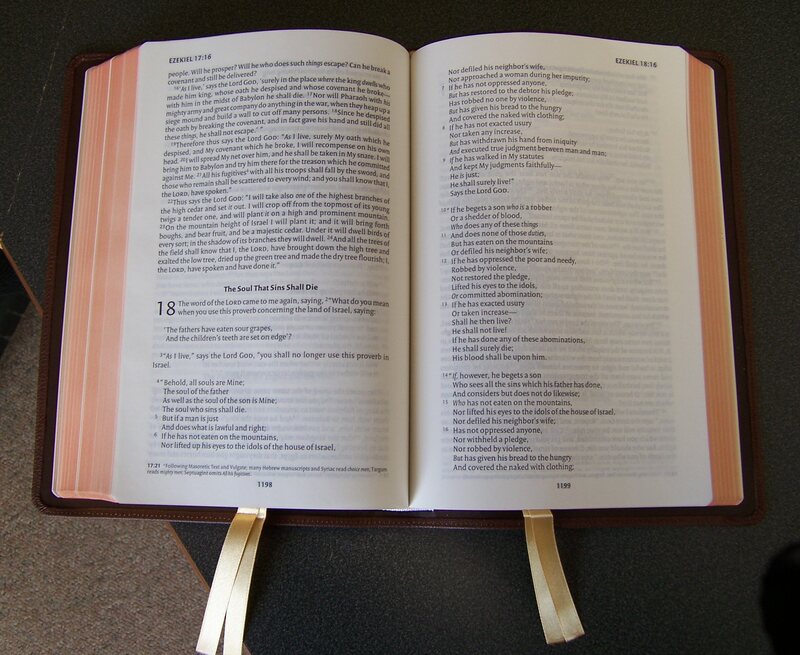 This means that the Bible will lie completely flat when opened; the Bible is limber, not stiff, and pages turn easily. The Schuyler also has art-gilt edges, where the edges are treated with red dye as well as gold gilding, which protects the edges of the paper against “foxing” (the age-related spots and browning seen on paper as it ages) and other blemishes. Like most Schuyler editions, the single-column NKJV is printed and bound in the Netherlands by Jongbloed, one of the most highly-regarded printers in the world, responsible for printing many of the editions sold by Cambridge University Press. Unlike the Schuyler Quentel editions that I hope to review in the future, the book block for the single column NKJV is not typeset by Jongbloed. It is printed by Jongbloed on high quality paper, but it is the same book block produced by Thomas Nelson for their mass market 2009 edition, only printed in a way that increases the type size from around 9 point to about 10.5 point, thus improving the legibility. Side by side, you can see that the two versions share the same text block. The Schuyler uses larger pages and a larger typeface, and you can see that ghosting is less pronounced. Frankly, I like the layout and readability of this Bible so much that I am willing to overlook the book block’s chief issue–ghosting. Quality editions use a method of typesetting known as “line matching,” in which lines on one side of a page are aligned so that they are directly behind the lines on the other side of the page. The result is that the “show-through” of the print is minimized–a definite advantage when one is reading the thin paper used to accommodate a 2000 page book in a volume we can all hold and carry. The Thomas Nelson book block used in my mass market bargain gets line matching right some of the time, but not always. And the same book block, even printed by a great printer like Jongbloed on better-quality paper, still shows ghosting in all the same places. This, however, is the only drawback; and it is not a serious one. 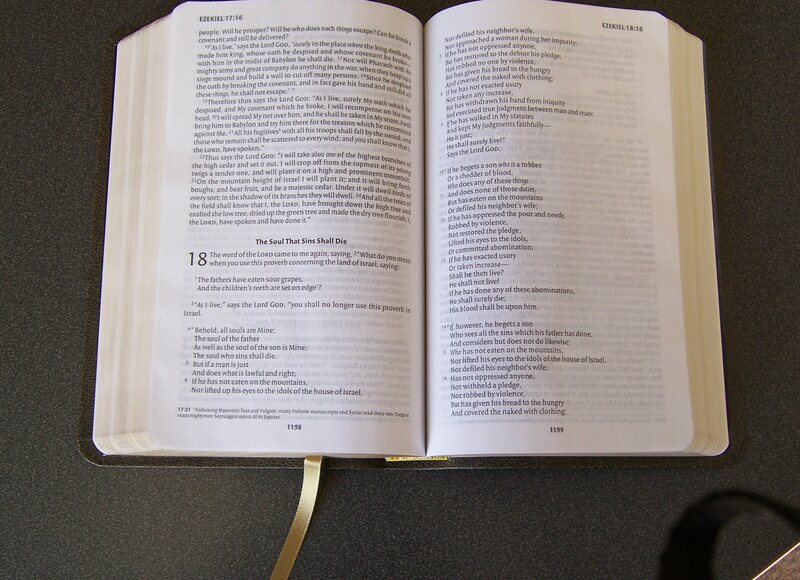 In fact, I find the ghosting to be far less noticeable than in many older Bibles that did not use line matching. The Thomas Nelson single column NKJV (top) and the larger Schuyler edition. 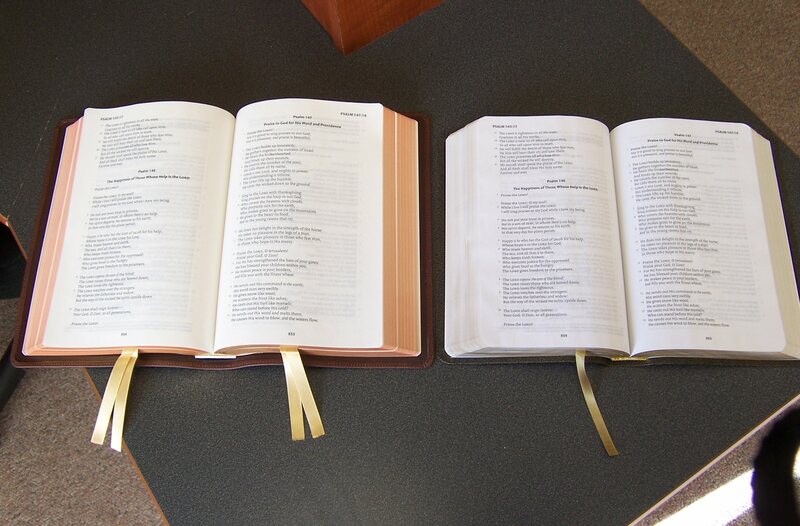 Side-by-side, the difference in the quality of the binding is readily apparent. So, in the end, what do I have? I have a rugged little bargain of a Bible in a layout that is as easy to read as the average novel–and that I don’t mind throwing in the car when I need to carry it somewhere. I treat it with the same reverence that I always do the Word of God, but I won’t have a heart attack if suddenly slamming on my brakes makes the Bible fly off the seat and land in a heap in the floor. Meanwhile, I have a truly beautiful edition of the Bible that I can read at leisure when I want to enjoy one of the finest examples of the bookbinder’s art. The Schuyler single-column NKJV is a delight to the eyes as well as to the touch. Hello and thanks for the review. I thought I'd just comment that the Schuyler Quentel is not typeset by Jongbloed but rather 2K/Denmark. Jongbloed "just" printed and bound it. Thank you for your review and photos! After starting to read NKJV on my tablet, I've realized what a difference single column makes for me. I was looking for a budget edition, and it looks like the Nelson one is just the thing.